Excellent guide. Very adaptable to our needs. Extremely knowledgeable. Despite the very heavy rain that greeted us in Halifax, Jay put together a very interesting tour, both informative and scenic and we now have a better appreciation of Nova Scotia and it's history. We had such a great day with Jay! We were able to do this tour and also include a trip to the Titanic cemetery. 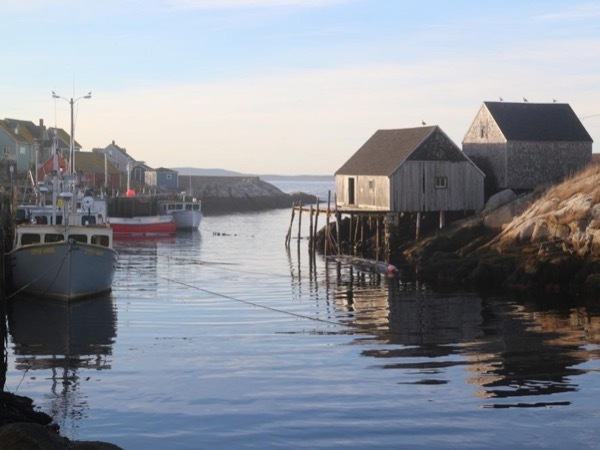 The trips to the small villages depicted the small town life of Halifax and the fishing industry. It was a nice sunny day at Peggy's Cove but a little windy. Jay gave us a nice overview of life in Halifax. He was also helpful and took our travel companion who is a firefighter fan to a local fire station. it was too bad we were on a cruise ship and could not take a lobster home! Thanks Jay! Jay was a great guide. Despite a morning which included cold, rain, wind, and snow, he kept us comfortable in his vehicle and showed us and told us many interesting things about Halifax. Would love to tour with him again, preferably under warmer, sunny conditions. Highly recommended! Nice, knowledgeable, and adapted the tour our needs. We really enjoyed our tour with him. TOUR GUIDE RESPONSE: It was my pleasure. Apologies for the Friday night cacophony -- Blomidon Inn would have been a lot quieter! TOUR GUIDE RESPONSE: Thank you for your generous rating, Hsin-Hui -- hope your tour was enjoyable for everyone in your group. Cheers! We were a party of six travelers and were extremely pleased with our tour with Jay. The weather in Halifax was overcast when we arrived so he gave us several very good options before we went to Peggy's Cove. Jay is very knowledgeable and we appreciated his information and the itenerary he chose for us. Thank you Jay for a wonderful time. Jay is an excellent tour guide and adjusted our tour to add a couple extra stops for places we had read about. He is very knowledgeable about all the sites and about the history of the area. He offered to take pictures of our group and did do with care. We also decided to change the order of the trip due to some rain coming and he was very accommodating. Very flexible tour in accommodating our interests. Gave us a chance to get outside the city & experience the coast firsthand. Learning about Toursbylocals was one of "life's blessings." While visiting Halifax, NS, Ca we requested Jay W who accommodated our schedule for an enjoyable afternoon of education, fun facts and ideal scenic views. Jay is quite an historian, educator and scholar. His years of study and subsequent insight into not only Halifax, but also Nova Scotia and Canadian history, produce an unsurpassed tour guide. We are now spoiled in our travel expectations and undoubtedly will contact Tours by Locals again. TOUR GUIDE RESPONSE: Many thanks for your generous rating -- hope your visit produces many happy memories! Our group of six recently had a wonderful tour of the City of Halifax and the surrounding coastal areas as conducted by Jay. He is an excellent tour guide, knowledgeable, personable and very professional. He described all the important landmarks in the city and the highlights of the fishing industry (lobster) and tour ships. We enjoyed this tour thoroughly and would not hesitate whatsoever to recommend Jay as a tour guid. His overall rating is a 5 (5 being the highest score). We thoroughly enjoyed meeting Jay and learning all about Halifax. When our cruise line shortened our stay in the city, I was easily able to communicate with him, and he adjusted our day to fit the hours. We especially enjoyed the little museum dedicated to the story of the sinking of the Atlantic in 1873 and meeting his friend who educated us on lobsters. We didn't think we could learn anything new about the Titanic, but his knowledge really enhanced the cemetery visit. We highly recommend him. TOUR GUIDE RESPONSE: Thank you for your kind words, Gail; your group's interest in local history was gratifying to me as a historian. Dave at Ryer's Lobsters is still educating people on his favourite crustacean -- we were there yesterday with three couples from Canada, the US and Australia! TOUR GUIDE RESPONSE: I had a great time as well, Dani. I appreciated your interest and your daughters were delightful! Hope you took good memories of Nova Scotia home with you. Jay was very, very knowledgeable and friendly. Answered all of our many questions and was very flexible in meeting all our requests. We highly recommend that you book your Halifax trip with him. Jay was a wonderful tour guide; the best you could ask for. His "bottomless" knowledge of people, places, things, history was phenomenal. In a word, FABULOUS trip. Jay was not only knowledgeable, but went the extra mile to point out things that uniquely interested us and would make his a custom tour. We recommend him highly. TOUR GUIDE RESPONSE: Thank you very much for your kind words, Rae. I hope Leonard got some great shots! This is our second time with Jay and he always keeps us interested. He has extreme depth of knowledge about Canadian history as well as US history so, as a US history buff, We had good conversations. We went to Mahone Bay and Lunenburg and he was very accommodating taking my wife to yarn shops (yawn). We had delicious ice cream, saw the interesting sites, and had a delicious early dinner in Mahone Bay at Rebecca's. He does book up so book early. He has a few different itineraries. Jay was a wonderful tour guide, providing a fantastic tour of Halifax and surrounding areas - one that most tours would not include. He also was extremely considerate in providing help and assistance that was well-beyond the normal obligations of a tour guide. I heartily recommend him and most certainly would seek his tour assistance should we return to the area. We were picked up on time in a nice, clean vehicle with plenty of room (4 of us). The day started out cloudy and then turned to rain and it poured all day long. Despite this, the tour was informative and we saw quite a bit. Jay is very knowledgeable and welcomed questions. Some surprisingly decent wines during the wine-tastings and beautiful tasting rooms/facilities. Wish we'd had more time to spend in Halifax and Nova Scotia! Jay was a fabulous tour guide. I had a wonderful time and learned so much avout the Annapolis Valley and Grand Pre. TOUR GUIDE RESPONSE: Hope I didn't bend your ear too much, Tammy! Many thanks for your kind words, they are greatly appreciated. Jay might be the most knowledgeable tour guide I've ever had the pleasure of touring with. My family and I did the Secret Way to Peggy's Cove tour and yes Jay knew all about that. But he also was well versed in the history of Halifax and Nova Scotia and I particularly appreciated his stories and insights of the land and its peoples. Simply great, I wouldn't hesitate to book with him again! TOUR GUIDE RESPONSE: Thank you for your rating, David - - hope you weren't late for the Silva! Jay was an excellent guide. Very knowledgeable about the history and the town. He personalized our trip to meet all of our interests. I felt by using Tour by locals we were able to see more of the town. Thank you for a great tour!! TOUR GUIDE RESPONSE: Many thanks indeed for your kind words, Harriet. I wish more visitors chose my military-themed tour -- there's so much to see that I usually exceed the allotted time frame. Jay is a terrific guide. The tour he gave us was a perfect way to see and enjoy the highlights of Halifax and the surrounding countryside and coastal area. We enjoyed Jay's presentation of the key historical background of what we were being shown. The lobster industry is huge in the Nova Scotia area, and Jay took us to a very interesting location to see and learn about it from a genuine expert. Our daughter is a skeptic regarding all "tours", but she told us afterwards, "That was great fun". Absolutely top notch!!! My wife and I had a wonderful day. Jay is fantastic!! Excellent guide. Jay provided a context for all that we saw. Jay was an incredible tour guide. He tailored the sights to see for what we were interested in. His knowledge was unbelievable regarding anything we asked him. The vehicle was comfortable and he even provided water for us. Jay made our visit to Halifax extremely enjoyable. We highly recommend him. Jay is one of the most knowable guides we have used. He taught history and so made our tour really come alive. He is also very flexible and accommodating. We have booked a second tour from him this year. TOUR GUIDE RESPONSE: Thank you for your kind words, Norris. Looking forward to our trip to the Annapolis Valley in August! Cheers! I could go on and on about what a wonderful time we had. In brief, Jay really knows his history, is a safe driver, will accommodate one's special interests, is personable and flexible. He knows where to find the good photo ops and great eats. The area is smashingly beautiful and full of fascinating stories. TOUR GUIDE RESPONSE: I couldn't ask for a nicer review to start the 2018 season -- Thank you! Jay was a terrific tour guide. He is an expert in the history of the area. We had a wonderful day exploring Nova Scotia. TOUR GUIDE RESPONSE: Thank you for your patronage. Hope you enjoyed your extra day in Halifax despite the weather! Jay was a wonderful guide. He was flexible, accommodating and thoughtful. His thorough knowledge of the history of the area was very interesting and gave us new insights. We enjoyed our day with him and highly recommend him as a guide. We were on a 6 hour private tour with Jay W. All the sites that we planned to see were covered with plenty of time for picture stops where there was interest. He also was very knowledgeable about sites we had seen in Sidney where we were on a less than ideal ship's bus tour. Highly recommend Jay! We loved Halifax and Jay made the tour one of the most memorable of our cruise. He first showed us some of the city sharing its history. (He's a history professor so we were in good hands.) We then drove a scenic route to Peggy's Cove enjoying several quaint villages along the way. No tourist busses until Peggy's Cove making our drive delightful! Ended the trip at a wonderful sandwich shop. A well organized tour by an excellent guide!! Knowledgeable, personable, professional! Jay was very knowledgeable of the area and the tides. We enjoyed all the tours we took with Jay. Would recommend. TOUR GUIDE RESPONSE: Your kind words are greatly appreciated -- many thanks! Jay was professional, intelligent, articulate, and a great resource for Nova Scotia. he is a wonderful guide and anyone who chooses to go with him will reap a memorable experience. He was flexible and entertaining and left us with a great deal more knowledge about Halifax and the rest of Nova Scotia than we had when we arrived, which was the goal. We had a wonderful informative day with Jay. He was very gracious, answered all our questions, and had our time paced nicely. Vehicle was comfortable, clean, and had plenty of space. He is a wealth of information regarding local history. Highly recommend! Jay is a historian so he was wonderful to share his knowledge of a beautiful city! Halifax is much larger than we expected and we only wish we had more time to explore. TOUR GUIDE RESPONSE: Thank you for your kind words -- I hope you come see us again in the not-too-distant future! Jay was a pleasure to deal with. He was extremely knowledgeable and worked with us on our itinerary. We would not hesitate to recommend him as a guide in Halifax. TOUR GUIDE RESPONSE: I enjoyed being your guide and introducing you to Acadian History. It was especially gratifying to make a personal connection with a Cajun 'cousin'. Many thanks for your endorsement! Jay was a wonderful guide! Knowledgeable and passionate about Halifax/ Nova Scotia history, We could not have asked for a better guide! I think he got a feel for what we were interested and tailored our tour to our interests and needs. If we had more time I would have booked him for a second tour outside of Halifax. VERY comfortable van, and he even provided Iceberg Water! Really, there could be no better guide for your Nova Scotia tour. Highly, highly recommend Jay! Fantastic tour experience with Jay. His style is quite engaging, and we felt that we were riding along with an old friend or neighbor, rather than someone whom we had just met. In addition to the big tourist draws, Jay took us to a couple of scenic and historic sites "off the beaten path", where we were the only tourists there, providing a unique and memorable experience. Highly recommended, you cannot go wrong with Jay as your guide. TOUR GUIDE RESPONSE: I'm so glad you enjoyed your tour. Your comments are especially meaningful to me because my aim is always to make travelers feel like "an old friend or neighbor". Thanks very much for your kind words. TOUR GUIDE RESPONSE: Your grandson was a delight, and I hope you both enjoyed the Titanic exhibit at the Maritime Museum of the Atlantic. Safe travels and come see us again! TOUR GUIDE RESPONSE: Thank you for your kind endorsement -- I appreciate your patronage. We give a five-star rating. Jay was punctual, offered options so we could choose what to see in the time available, accommodated all five people on the tour and provided excellent information on the history of the area. We were very pleased. This is the second time our group has used Tours by Locals -- in two very different settings. TOUR GUIDE RESPONSE: I enjoyed our time together very much, and hope I didn't talk your collective ears off! Thank you for your kind words. We had an interesting and informative tour with Jay. Would recommend him in a heartbeat. Wonderful tour. The guide went out of his way to make this tour memorable! TOUR GUIDE RESPONSE: I appreciate your patronage and your kind words. I enjoyed hearing about your many interesting travels, and I'm glad you added Nova Scotia to that list! Our aptly titled Acadian Tides & Vines tour was thoroughly enjoyable. Jay did an excellent job driving us safely while explaining Acadian history in an informative and colourful way. He is knowledgeable, enthusiastic and knew all the best spots and viewpoints in the Annapolis Valley. The wines and low tides were equally amazing. Thank you, Jay! It's so hard to choose a tour online - but take my advice, a definite win taking a day tour with Jay! He is courteous, professional, and provides terrific detail and info about Halifax and all of the surrounding areas. Family truly enjoyed his company and a great day! This was by far the BEST tour with the BEST tour guide ever!!!! Jay was absolutely fantastic, the four of us could not have asked for anyone better. He became a part of a very special day, one that we will always remember. Jay arranged a bus for 16 of us. It was for my mother in law's 90 the birthday. Jay was a wonderful guide. Very knowledgeable, very friendly and very accommodating. It was a wonderful tour. Jay made it a very memorable day for my mother in law. The bus driver Jim was also wonderful, and very helpful. I highly recommend Jay if you're in Halifax. TOUR GUIDE RESPONSE: It was a privilege to be your guide in Halifax; it was a special day for me as well. Thank you for your patronage. Jay was extremely knowledgeable and versatile; we had selected outdoor activities to do along with museums and we had a 100% rainy day which he accommodated well. TOUR GUIDE RESPONSE: Rain can put a damper on site visits but you were tolerant & genial companions. I'm glad we managed a short amble through the Public Gardens but sorry you didn't get to see the Maud Lewis exhibit in the Art Gallery of Nova Scotia. Next time I hope! Our tour guide (Jay W.) picked us up at the cruise terminal in Halifax and had us on our tour in no time. We had requested a visit to the Titanic Cemetery and the lobster lunch and both were provided. Jay was knowledgeable and pleasant and just plain made the shore excursion great. His tour was by far the best of the tours we took on our cruise. TOUR GUIDE RESPONSE: I appreciate your favourable endorsement -- many thanks! TOUR GUIDE RESPONSE: Thanks, Harold! TOUR GUIDE RESPONSE: Not many places in Canada can match Halifax for historic military significance. I was glad that you chose this as your third tour, as I don't get to York Redoubt and Shearwater Aviation Museum as often as I'd like. The free hot dogs were an unexpected bonus! Thank you for your kind words and for being such genial and inquisitive travelers. We had the pleasure of having Jay as our exclusive guide for three days during our visit to Halifax. Jay is a native of the area and his extensive knowledge of Halifax and surrounding areas is highly educational. We enjoyed the beautiful coastline and the lighthouse at Peggy's cove. Jay provided a tour of small villages along the route to Peggy's cove as well which was an added attraction. We will highly recommend Jay to our friends and colleagues. TOUR GUIDE RESPONSE: It was a perfect day for a coastal drive -- the leaves aren't out yet so the ocean views were spectacular. We were lucky to get a lobster at Ryer's -- they are closed on some weekdays. Glad you got your Peggy's Cove stamps too -- now you're honourary bluenoses! TOUR GUIDE RESPONSE: It was my privilege to be your guide for three different tours during your stay in Halifax. Thank you for your patronage -- and for bringing such fine weather! Perfect tour. Costs more than bus tour but you go where you want. Saw three off the path coves and fishing villages. Spoke with lobster fisherman working on boats and traps. You can't do this on a big tour. Jay called ahead for lobster lunch so we didn't have to wait in line. Jay was very knowledgeable about Halifax history. Even helped me find a hockey shirt. If you want a private and up close and personal tour Jay is your guy! Jay had so much insight about the history of the area and Nova Scotia that we are ready to return. The coves he took us to were exquisite. Of course you have to go to Peggy's Cove but it was no more beautiful than the first ones we experienced. One highlight was our fresh lobsters and mussels at Ryers. Jay made us want to return and explore more of the area under his tutelage. A great guide, his specialty is history, we were mesmerized. TOUR GUIDE RESPONSE: Many thanks indeed for these kind words. Apparently history + scenery is a winning combination! Really enjoyed meeting your Dad -- he's an inspiration to all of us. TOUR GUIDE RESPONSE: Thank you, Melinda! Wonderful guide!!!!!! Would recommend him. My wife and I certainly enjoyed our tour of Halifax with Jay. He modified our tour to fit our interests. Jay is very knowledgable about the history of the area and could relate the event to what was going on in the rest of the world. If you have the opportunity to have Jay as your tour guide, you will not only have an enjoyable tour but it will also be a great learning experience. TOUR GUIDE RESPONSE: It was a pleasure spending the day with you. Hope I get out to Oshkosh some day for the air show! TOUR GUIDE RESPONSE: Reviews like this really make my day; thank you! Jay built a custom tour for the four of us that we loved! We saw the highlights of Halifax and Peggy's Cove but we also saw and learned so much more. We really appreciated his ability to share his deep knowledge of Nova Scotia and all Canada. We love to hike and he led us to places and trails we would have never found on our own. Because he seemed to know everyone he met we heard stories and saw sites that were both unique and interesting. I can recommend Jay to anyone visiting Halifax. TOUR GUIDE RESPONSE: I very much enjoyed our day together. Thanks to your interest in hiking, we explored a trail section that I had never traversed myself. Others will benefit from our discoveries. Sorry it was so foggy! Jay was very informative and knowledgeable about Halifax military history. My stepfather, a Dday vet, particularly enjoyed the visit and beer with former fellow artillery men at the Royal Artillery Park in Halifax. Jay was also able to orchestrate a sessession at Admiralty House with the director of the museum including a look at one of the original copies of the naval plans for Dday. Thanks Jay for making the day special. TOUR GUIDE RESPONSE: It was a pleasure and a privilege being your guide; your stepfather's status opened a few doors not accessible to mere mortals. I was pleased to see that he was given VIP treatment, and well deserved too. Jay, with his local knowledge and his willingness to please, made our day with him the highlight of our trip! We were a group of 6 painters and we all paint from our photography, so we asked for a day filled with scenes fit to paint. Jay is a photographer himself, so he knew the hidden spots which were far from the tourist buses. Personally I was able to shoot enough for a hundred paintings, but certain special shots were all thanks to Jay. Lobster lunch was perfect too! Thanks so much Jay! TOUR GUIDE RESPONSE: You were such a fun group to be with -- it was foggy but it didn't dampen your enthusiasm. I got some pretty good shots myself that day. Keep on painting and don't forget Nova Scotia will still be here when you need a refresher! Another great tour.... Jay took us to areas of Halifax other tourist aren't taken. He was full of facts of the areas. Jay called ahead and ordered our lunch so that when we got there it was ready and we could enjoy a great lunch outside at the waters edge. Very relaxing and full tour of Halifax. Thanks again Jay. Fantastic tour. Off the beaten track. Loved it. Jay is very knowledgeable, knowledge and anecdotes that he shares beautifully throughout one's tailor made tour. Recommend to all! TOUR GUIDE RESPONSE: Thoroughly enjoyed introducing you to coastal Nova Scotia; hope some day I can visit some of your places 'down under'! We had a wonderful experience with Jay, an extremely knowledgeable, organized, flexible, and most pleasant guide. We were able to overcome an issue with group size and car size by seeing non-planned sites while we awaited a larger van. We saw all of the promised sites, learned a great deal from Jay and enjoyed the entire day immensely. Thank you Tours By Locals, and Jay. If I could have given Jay 6 or 7 stars, I would have. We have been to Halifax 3 times before and saw things most people won't on typical tours. Jay has a doctorate in Canadian history and a vast knowledge of US history as well. He is very well traveled and is very engaging. Lunch was delicious at a commercial lobster distributor served in plastic crates and lobster, mussels, or raw oysters only. He will take you places where the buses don't go. You will not be disappointed. TOUR GUIDE RESPONSE: I think four visits qualifies you as an honourary Bluenoser! Seriously, your kind words are greatly appreciated. Nova Scotia is fortunate to have visitors like you. Fantastic tour. Jay was extremely knowledgeable. It was well worth the money. The experience exceeded our expectations. Jay was very accommodating and friendly. I would highly recommend going this route when touring a new area for the first time. Thanks Jay for a great day! Jay gave us an outstanding tour - he outdid himself, gave us plenty of time to see everything and had good comments along the way. TOUR GUIDE RESPONSE: I have a feeling the best part of your journey is yet to come, but you were certainly gracious--and forgiving--guests, and it was my pleasure to introduce you to Halifax. Viagem Segura! All 8 of us thoroughly enjoyed our day with Jay. He is very knowledgeable on the history of the area. He planned several special treats for the group. The museum for the SS Atlantic was a highlight for all. Peggy's Cove is beautiful, but arranging whole fresh lobster for lunch at a local wholesaler was the icing on the cake for most of us. (reasonably priced) We saw a lot of the area and Jay answered all our questions. He is an organized, informative and pleasant guide. The kind we enjoy. TOUR GUIDE RESPONSE: It was my pleasure to welcome Judy & Bill to Halifax on the first cruise ship visit of the season! We truly enjoyed our tour with Jay. He was exceptional. Very informative and responded to our requests as well as made suggestions. Would highly recommend him. TOUR GUIDE RESPONSE: Many thanks for your positive comments -- next year I hope to have a larger vehicle! I highly recommend Jay W. as your guide in Halifax. He prepared a custom tour for us that included all the sites we wanted and included several others that complemented our requests. His background and historical knowledge of the sites we visited was a valuable resource. He provided us with a truly enjoyable day. TOUR GUIDE RESPONSE: It was my privilege to introduce such distinguished visitors to my native city. Please come see us again. We found Jay to be an excellent guide with a wealth of information on the local history-everything from the naval base, ship wrecks, city history, historic sites etc. We really enjoyed all the little fishing villages that he took us to and drove us around that most tourists would never see on a bus tour. He has a calm personality that always makes you feel relaxed. He will stop as often as you like. Jay really educated us on Halifax and area during our 5 hr. tour to Peggy's Cove. We HIGHLY recommend Jay. TOUR GUIDE RESPONSE: Travelers from the best coast are always welcome "out east." Seeing that hooked gull freed up by the fishermen on the dock was an uncommon sight! Thank you for your kind words. TOUR GUIDE RESPONSE: Thank you! Much appreciated. We had a wonderful time with Jay, he gave all the details of the history and attraction. We booked for 5 hours and end up to have a tour almost 6 hours. The place he bought us for lobster was fantasy. I highly recommend him to be your tour guide. TOUR GUIDE RESPONSE: It was a pleasure having visitors from Hong Kong -- East meets East! Thank you for your kind words.